The Minnesota Department of Human Services has created a new central system for reporting the suspected maltreatment of vulnerable adults. This central system is called the “Minnesota Adult Abuse Reporting Center,” or MAARC. This central system goes “live” on July 1, 2015, and creates a streamlined system for citizen access to reporting across Minnesota. In addition, the central system will allow for more efficient data capture and analysis. The MAARC system offers a single toll-free number for use state-wide in making a report: 844-880-1574. 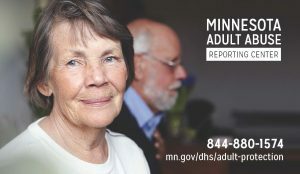 Additionally, mandated reporters can make a report online by visiting: mn.gov/dhs/reportadultabuse.